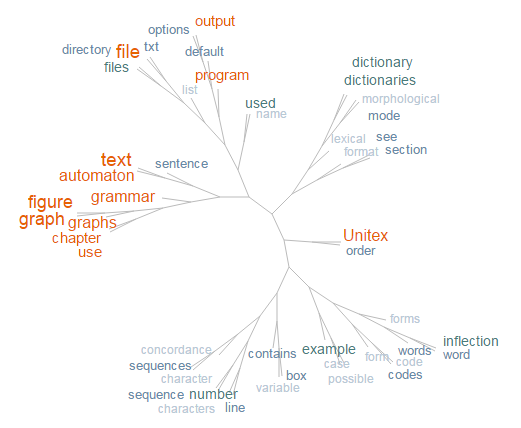 Unitex/GramLab is an open source, cross-platform, multilingual, lexicon- and grammar-based corpus processing suite. Unitex/GramLab releases are available here. Source code is hosted on GitHub. This page describes several student projects that could be undertaken to learn about Natural Language Processing (NLP), programming and open source software development practices while simultaneously working on the improvement of Unitex/GramLab. Anyone is welcome to participate as mentor or submitting new projects. The goal of this module is to compare two sets of annotations. Note: Some years ago, a former student developed a Perl script named SBDiffTool, a Sentence Boundary Visual Diff Tool for Unitex. A short time later, another student developed several Perl scripts (CiteExtract, CiteDiff, CiteEval) to compare two annotations sets, one set produced by Unitex and other manually labeled by an human. These scripts, which were developed for a very specific class of annotation, could serve as a starting point for build a more flexible and integrated tool. This project was developed under the GSoC'16 program by Mukarram Tailor from the Indian Institute of Technology Mandi, India. Final report is available here. MultiFlex is a multi-lingual Unicode-compatible module for automatic inﬂection of multi-word units (MWUs). It is meant in particular for the creation of morphological dictionaries of MWUs. It implements a uniﬁcation-based formalism for the description of inﬂectional behavior of MWUs which supposes the existence of a module for the inﬂectional morphology of simple words. In the last years, MultiFlex has evolved independently from Unitex. The goal of this project is to enhance the Unitex implementation of MultiFlex backporting these changes in a granular fashion. This project was developed under the GSoC'16 program by Aleksandra Chashchina from the National Research University Higher School of Economics, Moscow. Final report is available here. TreeCloud is a free software visualization tool which display the most frequent words of a text as a tree cloud. A tree cloud is an extension of a tag cloud, in which the words are located around a tree representing how close they appear in the text, and where attributes like size and color are used to reflect the word frequency. Understanding the Unitex Concord module and the concordance files produced by Unitex. Porting from Python (TreeCloud) to Java (Unitex/GramLab IDE) the functions to compute the co-occurrence distance between pairs of words. Enhancing the tree visualization to allow users to easily go back to the source text and visualize the context of occurrence of a specific word. Plugins are built on PF4J, an open-source, lightweight plugin framework for Java, with minimal dependencies and easily extensible. Plugins are distributed in ZIP files with all runtime dependencies bundled, that can be installed without difficulty by copying them into the App/plugins folder. Concordance viewer as illustrated in the User's Manual, Fig. 4.8. Dictionary viewer as illustrated in the User's Manual, Fig. 3.2. Graph editor as showed in the User's Manual, Section 5.2. Graph exporter as described in the User's Manual, Section 5.4. Plugin manager, a user interface to manage plugins. Transcoder as illustrated in the User's Manual, Fig. 2.3. Xalign as described in the User's Manual, Chapter 10. Treecloud, for TreeCloud-style visualization of Unitex concordances. Unitex supports a lexical mask called TDIC that matches any tagged token in the text. Unitex/GramLab 3.1beta version introduced tagging generalization graph that matches user specified tagged token in text and then searches untagged instances of the token. The tagging generalization graph is too restrictive and works only as part of CasSys. The proposal is to create a new lexical mask, UDIC, in order to combine the functioning of TDIC and tagging generalization graph. This lexical mask has to be written with constraints i.e. <UDIC> is not allowed. It does not accept negations either (!). This mask will lookup untagged instances of a token defined by constraints. Unitex has a function to convert the text automaton into a 'POS list' format (FST-Text dialog box, Table pane, 'Export all text as POS list' button). The project consists in implementing the reverse conversion in case all lexical ambiguity has been removed from the 'POS list' format. This function was suggested by users that remove lexical ambiguity from corpora manually, but do part of this revision on the 'POS list' format. They want to be able to convert the resulting corpus back to the FST-Text format, so that they can apply search queries on it later. Currently, boxes in the text automaton can be manually modified or removed in order to revise the tagging of the text, but it would be useful to be able to add new boxes with new analyses. The difficult part is to deal with the case where parts of a word are tagged separately. This function was suggested by users that remove lexical ambiguity from corpora manually. Currently, the 'Export all graph paths' function (in the FSGraph > Tools menu) lists the paths of a graph and writes them in a file. If the graph is a morphological dictionary-graph (Manual, Section 3.8.4), it would be useful to extend this function so that it makes an additional processing of the lexical masks in the graph. At each occurrence of a lexical mask, the new function will search the morphological-mode dictionaries for entries which satisfy the mask, and replace the mask with them. The resulting list will be a list of forms with lexical information. Such a list of forms can be converted into a DELAF-format dictionary. This function would be useful for some languages in which morphosyntax has been encoded with morphological dictionary-graphs (MDG). In Malagasy and Arabic, for example, the word forms described in the MDGs are in finite number and do not run into a combinatorial explosion. It would be interesting to generate all of them into a full-form dictionary, so that Unitex/GramLab can process the language like more weakly inflected languages such as English. LexiMir, formerly ILReMaT, is an open-source dictionary manager in C# created at the Language Technology Group of the University of Belgrade (Krstev et al., 2004; Krstev et al., 2013). The project consists in rewriting LexiMir in Java and integrating it into Unitex/GramLab. LexiMir was designed for dictionary-management tasks not implemented in Unitex/GramLab. If you have any questions, please do not hesitate to send a message to the developers mailing list or post back at the users forum.